Analog Man carries the Boss OC-3 Super Octave. 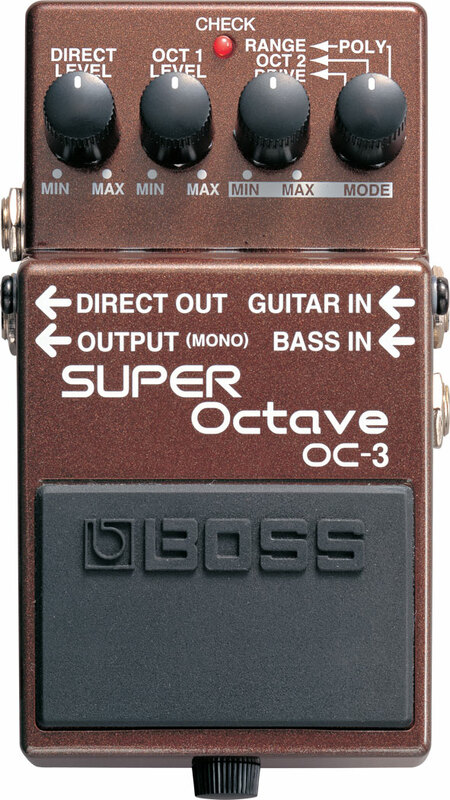 The BOSS OC-3 Super Octave gives guitarists high-quality octave effects with a single stomp. Three modes are provided, including a new Polyphonic Octave mode, a Drive mode with distortion, and the original OC-2 mode. The BOSS OC-3 Super Octave gives guitarists high-quality octave effects with a single stomp. Three modes are provided, including a new Polyphonic Octave mode, a Drive mode with distortion, and the original OC-2 mode. The versatile OC-3 also works with bass! All-New Octave Effects: The OC-3 picks up where the best-selling OC-2 left off, giving guitarists two brand new octave effects. Using the Polyphonic Octave mode, octaves can now be added when playing chords—a first in a compact pedal. More aggressive sounds can be had using the new Drive mode, which adds a touch of distortion to the octave sounds. If You Loved the OC-2… Don’t worry. BOSS knows how much guitarists depend on the original OC-2 sound. That’s why the OC-3 includes that classic “dual octave” effect, but with even better stability. This gives you the ability to blend up to three individual sounds: the original note, a note one octave below and one that’s two octaves below. Bass Players Welcome: The OC-3 isn’t just for guitar, it’s also for bass. By connecting a bass guitar to the dedicated Bass input, the OC-3 automatically optimizes itself to suit the range of a bass guitar. Now bass players can upgrade to the ultra-stable octave sounds of the OC-3.